Inboden’s Meats make the perfect gift for a variety of occasions (corporate, birthdays, Christmas, Thanksgiving, thank yous). 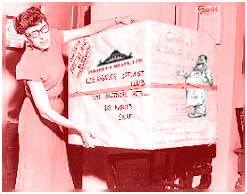 We have several gift packages from which to choose. All freezer packages are hung on the rail open air. Naturally aged for tenderness. Cut and double wrapped to your specifications and flash frozen. Local, high-quality beef the old fashion way. 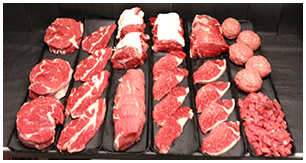 Our prime grade beef steak boxes are hand selected and individually hand cut and trimmed. Our beef is aged at our facility to ensure exacting tenderness. Our beef is locally produced to meet our exacting standards, thus ensuring the recipient a juicy, tender and flavorful steak. 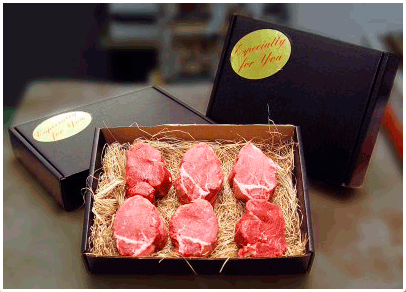 Each steak is individually vacuum-packed, flash frozen and placed in an attractive glossy black gift box. Our pork is selected from Duroc and Berkshire breeds, pork that is produced for a great eating experience. Our pork is sourced locally and DeKalb County is always in the top producing hog counties in Illinois. Poultry gift boxes are hand crafted with our homemade stuffing. Specialty combination boxes can be produced and specially created, although we ask for some lead time for these requests. Looking for facts on freezer beef? Click Here to learn more. Cut, freezer-wrapped, and flash-frozen to your specifications. Spare Ribs: One rack cut, freezer-wrapped and flash-frozen to your specifications. 20 lbs of Boneless Skinless Marinated Chicken Breasts – Pick any two flavors: Italian, Southwest, Butter Garlic, Tequila Lime, Lemon Rosemary, Honey BBQ. Pork roasts, Chops, Country style ribs. Cut and double-freezer wrapped to your needs. Flash-frozen to your specifications. Double-freezer wrapped to your needs. Flash-frozen to your specifications. 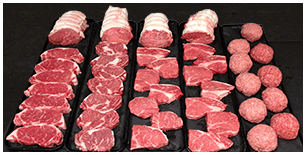 Inboden’s Meats make the perfect gift for a variety of occasions. We have several gift packages from which to choose, including selections of our prime beef, pork, poultry, seafood and combination gift packages. If none of these suits your needs, we will be happy to assemble a custom gift package. Baked Honey Ham – Taste the way ham used to taste! Old fashioned dry-cured ham spiral sliced around the bone and baked with a honey and spice glaze. Great hot or cold. Hams are packaged and individually wrapped in a gift box with complete instructions. * Custom Gift Boxes available upon request. * Please Allow 24 Hours Notice when placing orders on all Gift Boxes. Inboden’s Guarantee: Prices subject to change with market conditions. Inboden’s sells only the finest, locally produced, USDA Top Choice and Prime meats flash-frozen to your family’s specifications. If you are not completely satisfied with any product, Inboden’s will replace your purchase item for item.